The NFL’s first full week of preseason football kicked off with a bang on Thursday night, as seven contests took place across the country. In Buffalo, the Bills were defeated by the visiting Minnesota Vikings, by a score of 17-10. While Vikings fans got to see a little bit of what could be as RB Dalvin Cook took center stage to start the game, Bills rookie QB Nathan Peterman may have stolen the show after he led Buffalo on an impressive 13-play drive in some extensive action, but ultimately failed on two chances inside the final six minutes to draw level. 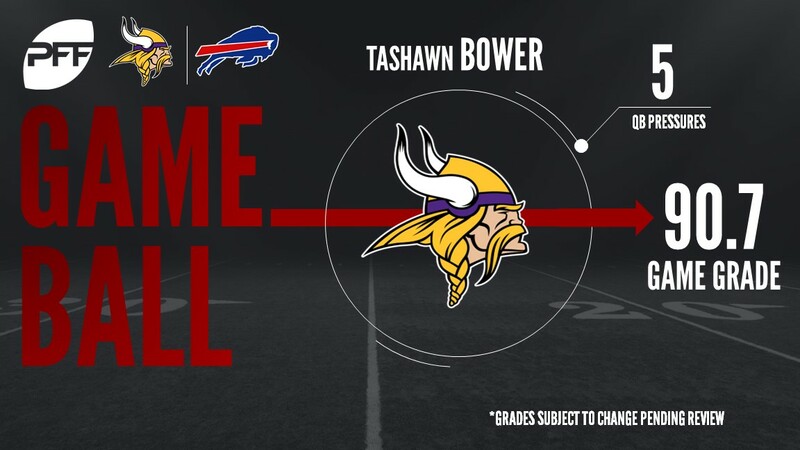 The Vikings and Game Ball winner Tashawn Bower ultimately came out on top, and with that we give you our PFF exclusive takeaways from the contest for each team. Very little to write home about on offense for the Vikings. One bright spot was the Miami Hurricane rookie wideout. While collecting three-of-four targets for 67 yards, Coley produced 8.0 yards after the catch per reception. He closed out the first preseason game with a 5.58 yards per route run average on 12 snaps in route. The Minnesota offense sputtered during its first taste of 2017 preseason action. Cook departed from Florida State as one of the top backs in the country, but slipped a bit during the draft. While he wasn’t able to find too many creases in the defense on the ground, he made up for it through the air. On 11 snaps in route, Cook collected each of his four targets, and produced an impressive 2.91 yards per route run. Bower dominated backups, posting five total pressures including a sack and a hit. His 48 snaps were the most of any defender on the Vikings, capping it with a game-high 89.3 pass-rush grade. Kearse displayed the same physicality we’d come to expect from him at Clemson. He made two stops in the run game including one on a crucial third and short. Bills fans got their first look at the rookie quarterback and the results were pretty good. Peterman led the Bills only touchdown drive of the game, capping it off with a pinpoint fade route touchdown. He may have only had a completion percentage of 50.0, but his adjusted completion percentage was a respectable 75.0. At 34 years old, there were some questions heading into this season whether or not Incognito could maintain the high level of play we’ve seen from him since coming to Buffalo. He did his best to answer them Thursday with a superb run-blocking performance in only 17 snaps, with an 85.7 run block grade, a game-high. While Tashawn Bower took home the game ball for the Vikings, Yarbrough’s play should not go unnoticed. Piecing together a sack, QB hit, two pressures and two defensive stops, Yarbrough finished the game with a pass-rush productivity of 13.5. Seeing the field with the second-string defense didn’t prevent Valles from pressuring Bills’ quarterbacks on four occasions. The former Virginia Cavalier would do his damage on only eight pass-rush snaps, producing a very impressive 37.5 pass rushing productivity.